Bonding has been the holy grail of Load Balancer. This term was used in the older days when a MUX (multiplexer) is used to bond multiple lines together from a single network provider. However, it’s technically impossible in the multi-WAN, multi-provider setups. 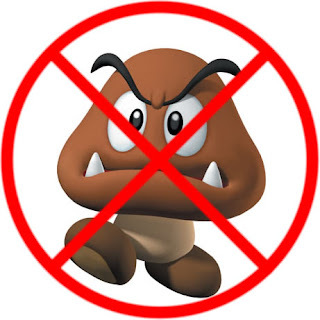 Recently, some readers emailed me about a device from Mushroom Networks which claims to be doing "real bonding". See attached advert from Google Adwords. I was so excited to find out. So I give them a call, and guess what. It's a hoax. This HTTP active intercept at the router level could cause compatibility problems too. For one, what if a user runs HTTP on a port other than port 80, no "bonding".... What if an application (such as uTorrent) runs non HTTP traffic over port 80? What if a server restricts single connection to a protected/DRM content... God knows. 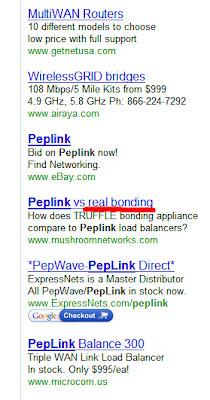 Be a smart customer and ask intelligent questions next time when someone claims real bonding again. At lease our informed readers, like yourself, should ask "Can it bond any Internet traffic? Or just some or one Internet protocol? Is there any chance of causing compatibility problem?" DON'T BE FOOLED BY "REAL BONDING!" Update: Due to popular demands, I have updated this article with the interesting ad. Guys, please stop emailing me for their name now. Thank you! I agree this functionality is very misleading. It appears they're just using a HTTP proxy server that distributes multiple requests. For the most part that's pointless, and it has a lot of compatibility consequences. Real bonding is not possible without ISP involvement. This is just an ugly, problem-prone hack.